Here you'll find the complete set of TMC photos that we have. 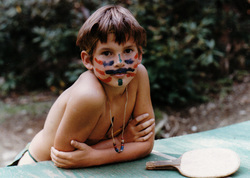 So if you still have old camp photos sitting around our house, please consider adding them to our collection. You can either email them to me, use the upload link below, or send me a CD or even hard copies. I'll return your originals. 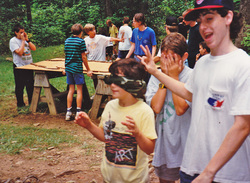 In the meantime, we're happy that nearly 250 photos are here to remind us of those days at TrailRidge Mountain Camp. Visit each gallery by clicking on the title or the highlighted link below. On each gallery page you can click an image to enlarge and read the caption. Click to see the first set of photos uploaded...our facilities. Keep in mind that some of these were there the first day and others added in later years. So if you only came in 1982, you can see what you missed out on. 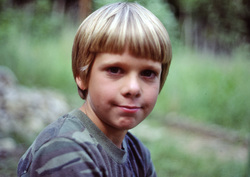 Click to check out photos of some of the faces from the first years of TrailRidge. 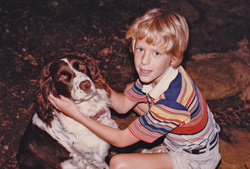 Pictured here is Roger with Tally, one of many camp dogs over the years. Click to check out some of our camp activities enjoyed on our camp property and in the surrounding forests and mountains. Click to check out this group of photos from 1989. This set was sent to me by Ari Klein, an AT backpacker who ended up staying with us for a while. Click to check out this first set of photos we converted from a tray of slides we still. Many of these three slide sets date from the late 80s - through the end of the Buladean years in 1995. Click for set number 2. Many of these photos date from the late 80s through the end of the TMC Buladean years. Click for set number 3. Many of these photos date from the late 80s through the end of the TMC Buladean years. 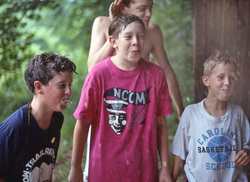 Former camper Chris Weld sent in this photo of three TrailRidge friends who happened to be brothers. Chris is on the left, his half-brother Patrick Barnhart (a TMC counselor) is in the middle, and little brother Peter Weld is on the right. They're pictured here in front of the camp dining hall. This camper submitted photo will be the first of a new photo gallery. Please send me yours to include so we can get the gallery filled with old camp memories. 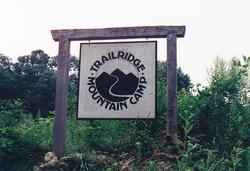 The last summer of TrailRidge in Buladean was in 1995. The property was sold to become a rustic retreat center and I did return a couple of years later to take a look. It wasn't nearly as rustic as when we left. I did get back in 2009 for one last visit and this is when this set was taken. Click to take a look at more recent of photos of TrailRidge. Before there was a TrailRidge Mountain Camp, there was Open Road Experiences. We were based out of Metairie Park Country Day School in New Orleans (okay, Metairie), Louisiana. Several ORE campers followed us to North Carolina and remained at TMC for many years as either a camper, counselor, or both. These are the only known photos remaining from the Open Road days. These were relatively rustic trips - we slept out and cooked our own meals for weeks at a time. Click to check out these photos. If you were only a TMC camper, you're still likely to see several TMC guys in these shots. And amazingly, after over thirty years I'm still at it. Trips today are shorter and very similar to the old Open Road days, except not nearly so rustic. In 2012 we had the first set of second generation "campers" on our trip to Wyoming & Montana. Ray Thompson, an Open Road leader and TrailRidge leader, continues to join me on a trip each summer. The MTA logo was actually created for Open Road Experiences by ORE staffer Doug Campbell. It was updated just recently to become the logo for MTA. Click to see info about MindStretch Travel Adventures.